I know I said I’d be writing Part 4 of my Nurturing series, but I have something else on my mind. Besides, part 4 is proving fairly difficult to write. I want to talk about bullies. 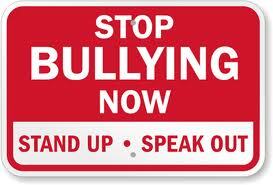 When we think about bullies, it usually brings to mind children on the bus or playground at school. More often these days, we hear it in the context of someone taking their own lives because they’ve been a victim of relentless bullying for whatever reason. Most of us don’t think about adults being bullied. We tend to think that by the time we become adults, we all know better. Well that simply isn’t true. Twice over the past few weeks, someone I know has been the victim a bully. I don’t think this person would have ever put the “Bully” label on it, but that doesn’t change the fact they were being intimidated by an overbearing adult. This person essentially agreed to work for free because the Corporate Bully (CB) was unhappy. CB was not pleased with some work this person did. He had been given every opportunity to see progress along the way, but ignored all communication. Once he saw the work he was angry. After realizing his lack of communication was a big part of the problem, he decided to carry on with the work but changed the terms agreed upon by both parties at the beginning. In the end, the person I know is getting the super short end of the stick, but in order to keep peace and get it over with, he agreed to CB’s terms. That means long hours put in and very little compensation. Just because a person is louder and more forceful than you are doesn’t mean you need to take it lying down. Stand your ground, be strong and fight for yourself. I don’t mean to physically fight, but don’t back down from your principles. Also, the next time you’re on the phone with a company who has irritated you, or you’re in a super long line and the person running the register is super slow, take a few cleansing breaths and don’t take out your frustration on that person. Don’t be the jerk at the restaurant who treats the server like total trash. Don’t yell at the person making your coffee too slowly for your liking at the coffee shop. If you do act like that, guess what? You’re being a bully. Being a bully doesn’t make you respected. It doesn’t make you cool or likeable or popular. It makes you a sad, sorry, hated person If you know someone that needs help with bullying, here’s your one stop shop for resources on the subject. StopBullying.gov I would also like to direct your attention to thetrevorproject.org and itgetsbetter.org If you know someone struggling with bullies because of their sexual orientation. Now that I’ve discussed my intentions to nurture my faith and my marriage, I bring you to the next area I’d like to spend energy focusing on. My next area is our home. I don’t know if I’m actually a terrible housekeeper, or if I just can’t keep up with the mess that 5 people living in a fairly small space create. Every surface is usually covered with random stuff. Dishes tend to sit in the sink longer than they really should. This is a direct result of having to hand wash the dishes. That’s the #1 job I absolutely hate doing. I put it off which (of course, duh!) makes it worse which makes me want to put it off some more. More often than not, the dishes from the previous night get washed as I’m making dinner. I’m not proud of that. I don’t think I”ll ever have a totally clean and peaceful as long as our bedroom doubles as Jason’s office. I try to keep “my side” fairly clean, but it’s so easy to let clothes pile up on the floor when the rest of the room looks like a mess anyway. I know it sounds like I’m blaming my husband for the mess, but I’m not. It’s just the way it is. He spends all day at his desk and the very nature of his “office” is organized (sometimes) chaos. Honestly, I could go on and on about how messy we are. I won’t do that to you. But what I intend to do is be more mindful of my surroundings. I’m trying to create the habit of taking something with me that doesn’t belong when I leave a room. I also try to remember to look around and if a task will take less than 5 minutes, just do it. It’s not easy, but I’m pretty tired of living in a mess all the time. I mean come on! I’m a stay at home mom and wife. All 3 of my kids are gone a large part of the day 5 days a week. It really shouldn’t be too difficult to stay on top of the housework during the week. I want to do better for me, for my husband and for my children. I’ll have one more part in this series soon. It’s probably the area I struggle with the most. It’s the area of my life I’m least proud. It’s one of the most important aspects of my life that I really need to nurture. Oh, a quick little update. I just want to share that so far (I know it’s only been 21 days) I’ve managed to do my daily bible reading. The reason I’m proud is that I’ve hit my first milestone. I lasted longer this year then I did last year. In my previous post, I discussed how I plan to nurture my relationship with God. The next area I want to spend energy nurturing is my marriage. While my husband hasn’t actually completed the test to determine which is his particular “love language,” I feel pretty confident in saying his #1 would be “Physical Touch.” Me? Not so much and I tend to pull away from physical touch a lot of the time. Touch just isn’t that important to me. Mine is “Words of Affirmation.” I want people to acknowledge when I’ve done something well. However, I need to remind myself that it’s ok to be physically close to my husband any time, and that it’s totally normal to want to physically touch someone. It’s also ok if he wants to just wrap his arm around me or lay a hand on my back as I drift off to sleep. I need to keep practicing the art of not being a nag. I need to be patient and remember he’s my husband, not my child. I need to treat him with the respect he deserves as well as the way I want him to treat me. So far I’ve discussed nurturing my Faith in God as well as nurturing my marriage. Come back soon to see what else is on the agenda. There are plenty of more areas for me to work on. Otherwise known as stepping outside of my comfort zone. I don’t know how many people that read this know my husband (and I, kinda) started a Disneyland Resort centric website. Well, it really began with a twitter account. Jason and I were in The Golden Horseshoe one afternoon waiting in line for ice cream. While waiting, a woman near us was ranting about something, I can’t remember what her beef was anymore, but somehow that encounter turned into Overheard at Disneyland. You’d be surprised by some of the things you hear people say while visiting the parks. The twitter account has grown from 2 followers (myself and Jason) to 4733 users at the time I’m writing this. It was really exciting when Jason and I weren’t the only people using the account to post things they’ve overheard. We’ve met a lot of great local people (and annual passholders) just because of the twitter account and website. Anyhow, fast forward another year or so, and meeting fellow Disney fans, and the DLR Network (DisneyLand Resort) was born. Our goal is simple. To bring together true fan websites and create a hub where we can all link together and help each other grow. Yesterday we had our first “TweetUp.” I have to be honest, I was so uncomfortable with the idea simply because I’m a bigtime introvert. And here’s my husband asking me to step out of my comfort zone and attend this thing. I didn’t want to. I really didn’t. But there was no way I wouldn’t go because it was important to Jason. He’d be seriously annoyed with me if I didn’t go. So I went. And I’m SO glad I did. I met some very cool people and participated in some really fun events. One of the highlights for me was the Pirates of the Caribbean group ride. We somehow managed to stuff 22 or so people into 1 boat. The moment we left the dock and started passing the Blue Bayou, the entire boat erupted into an extremely loud rendition of Happy Birthday, everyone singing to Jason since his birthday was the day before. We all did a Jungle Cruise group ride and a group picture on the Rivers of America. From there it was the Tiki Room and then over to Village Haus for dinner. At this point it was getting dark and some attendees were drifting away or going home. We were left with the guys from Days In The Park, Finding Mickey, OriginalD, our favorite castmember Jason and his lovely girlfriend Julie and Jessalyn’s newest ride buddy, Jenna We spent quiet a while at the Village Haus chatting it up. After that we went over to Pinocchio so the little ones could have their turn on little kid rides. It was at this point I thought we’d lose the group from OriginalD. There were 4 of them. all college age, and I really thought they wouldn’t want to do kiddie rides. Turns out I was wrong and they rode Pinocchio as well as Casey Jr. Train. From there it was off to Big Thunder Mountain. Jenna convinced Jessalyn to go on the ride which she absolutely loved. By then it was late and we needed to get Jessalyn to bed. Jason and Jess really didn’t want to leave. Heck, I didn’t want to as long as the others were still there, but I had to insist we go home. The day was absolutely Magical. Every single person I talked to, whether I met them officially, or just had a conversation with without ever getting their name was great. Everyone was really great. I stepped out of my comfort zone and I was gobsmacked by what an amazing time I had. I’m still basking in the warm fuzzies from yesterday. I absolutely can’t wait until the next TweetUp. I’m sure it’ll be even better than yesterday. So for those of you that read this and were there, thanks. Thank you for making Jason feel special by singing to him, thank you for being awesome people and thank you for coming. I look forward to our next meeting. I can’t wait to see where else this Disney adventure takes us! To be honest, I can’t wait for this year to be over. We’ve had two first time ER visits, one for me, one for my son. I had my first broken bone ever, and my son squeaked by with no issues when he fell off his skateboard and hit his head on the street. Talk about a scary moment getting that call. And then there’s the “little” thing with my husband being laid off for the third time in 4 years. 2010 hasn’t been particularly kind to us. I’ve seen other people say the same. My hope for our family in 2011 is that everyone stays healthy and OUT of the ER, and that my husband can get a good GREAT job. That’s the thing, he’d like something better than a job for the sake of having a job. However, we may be getting to that point anyway. Employment is proving to be very difficult order to fill. This is the longest he’s been out of a job yet, and it’s starting to get a little scary. My hope for you is that 2011 is kind to you and yours. May you be blessed beyond measure.